In 1804, Moses and his family relocated to an area just six miles from Vienna, to an area known as Willington. Willington was a more rural area beside the river, where a population of fellow Scotch-Irish lived with a sizable portion of French Huguenots who had fled from the persecution they faced in France. 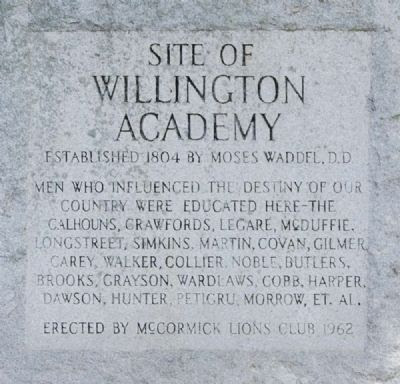 This was where Moses began a school called Willington Academy, which would grow to be one of the most prominent schools in all of the southeast United States. When school was in session, few of the boys returned home for time and distance sake, and rather many would house together in cabins built nearby-not official dorms, but places that the boys themselves kept up. In class, Moses lead about seventy to eighty students, versing them in Latin, Greek, French, and in other arts and sciences to prepare them for entrance into higher colleges. He pushed a rigid course load. For instance, Moses would drill them daily on memorization, translation, and recitation of large sums of texts of Greek or Latin, keeping score of who could manage the largest section (that was over 1200 lines recited by George McDuffie from Horace). This was one of the many ways in which Moses motivated his students. As for the relationship between the boys themselves and Moses Waddel, there seemed to be a respect for the man-even as he was a stickler for rules and discipline. Even as excitable as this particular anecdote seems, it was not a typical occurrence when it came to Moses. He took a particular attention to the moral upbringing of the boys. He was not just concerned with their intellectual state, but their emotional and spiritual as well. “Waddel cultivated informal relationships by visiting the boys at night in their various log cabins and boarding houses, where he was able to evaluate their progress in an informal setting. The letters from his students to him unanimously mention a fond appreciation of his interest his advice, his regard, his concern for their moral betterment. Even despite his strict rule and serious nature, he was not entirely without humor. Moses Waddel spent nearly fifteen years with Willington under his care. During that time, he received a doctorate from the College of South Carolina, and ushered through over one hundred students, many which went on to be prominent men across the southeast and all of the United States. Towards the end of his tenure at Willington, he had several times been approached to take up the Presidency of the University of Georgia, formerly known as Franklin College in those days. He turned it down for many reasons that he counted for himself, one among them was observed by his friends and family to be because of the state of his health. He was often prone to deep anxiety, and the idea of picking up such a weighty responsibility terrified him. However, as he sought counsel from those around him, and after time seemed to move in his heart, he finally accepted the position in 1818. At forty-eight years of age, Moses Waddel left South Carolina with his wife and children to Athens, Georgia in May of 1819. The Church-Waddel-Brumby house was where Moses lived during his tenure as President of UGA. Now, it functions as a historical marker and the Athens Welcome Center. Moses Waddel was welcomed to the University with great esteem. “‘Success to the University of Georgia,’ President Monroe toasted in 1819 to a dinner party given in his honor at Athens. Seated at the table with Monroe was Moses Waddel, the new president of that institution, and the man upon whom success depended. Earlier in the day Waddel had conducted Monroe to his hotel and made a speech of welcome to him. That night a dinner party was given Monroe, and the college held a festival ‘illumination’ or lighting of all rooms in the college buildings. This had been the fashion since the illumination of all Paris on the night of Napoleon’s wedding to Marie Louise. The presence of President Monroe and a welcome party had little to reflect the actual state of the college. Though Moses Waddel’s arrival was celebrated, it would not be long before he had to take up the hard labor of attempting to turn around a failing college, evidence even by his family’s lack of home for the first several years. When they had first arrived, the President’s house was in a decrepit condition, as it had been neglected for over fifteen years. In this circumstance, Moses, his wife, and all five children boarded in what was known as “Steward’s hall” or the “Commons” for the students. With time and diligence, though, Moses’ former experience of building up grammar schools and churches across South Carolina and Georgia served him well in the administration of a University, and the building up of a town. Over the course of the next decade, the attendance of the University increased from seven to over a hundred at a time. Several of his own sons would later graduate: James, Isaac, and William and both William and James would take up a professorship at the University in later years. Waddell Hall was completed in 1821 during Moses Waddel’s tenure and is the oldest building on campus. Indeed, the respect that Moses gained of his students in past stations, he received ten-fold also in the men that attended the University. Yet, there were still instances of his reprimands which put the boys in their place.